Metal shoe horn with a polished plate finish. 79cm (31 inches) in length - classic design. Metal shoe horn with a polished plate finish. 59cm (23 inches) in length - classic design. 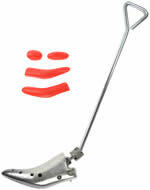 Metal shoe horn with a polished plate finish. 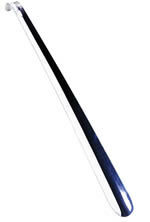 42cm (16.5 inches) in length - classic design. 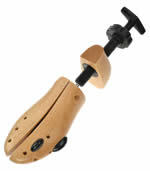 Helps feet slip into shoes without damage to the back of the shoes. 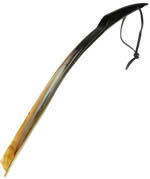 This hand made hoe horn is made from polished horn with a leather thong through the tip of the horn. The shoe horn still has the natural curve of the original horn as well as having the tip of the horn. Real horn is a beautiful and tactile natural material which is immensely strong. Each shoe horn is different as the curve will differ as will the colours which vary from shoe horn to shoe horn! Minimum length is 25.5" / 65cm. Each. 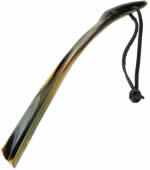 Hand made shoe horn which is made from polished real horn with a leather thong through the tip of the horn. The shoe horn still has the natural curve of the original horn as well as having the tip of the horn. Real horn is a beautiful and tactile natural material which is immensely strong. Each shoe horn is different as the curve will differ as will the colours which vary from shoe horn to shoe horn! Minimum length is 23.5" / 59.5cm. Each. 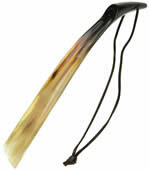 Hand made shoe horn which is made from polished real horn with a leather thong through the tip of the horn. The shoe horn still has the natural curve of the original horn as well as having the tip of the horn. Real horn is a beautiful and tactile natural material which is immensely strong. Each shoe horn is different as the curve will differ as will the colours which vary from shoe horn to shoe horn! Length is 21-22" / 53-56cm. Each. 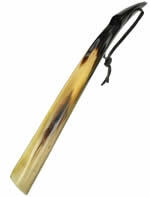 Hand made shoe horn which is made from polished real horn with a leather thong through the tip of the horn. The shoe horn still has the natural curve of the original horn as well as having the tip of the horn. Real horn is a beautiful and tactile natural material which is immensely strong. Each shoe horn is different as the curve will differ as will the colours which vary from shoe horn to shoe horn! Length is 17" / 43-46cm. Each. 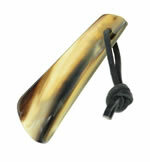 Dasco shoe horn made from polished real horn with leather thong through tip end of the horn. Real horn is a beautiful and tactile material which is immensely strong. Length is between 17" and 18" ; 43 - 46cm. Colours vary from shoe horn to shoe horn! 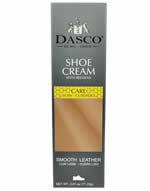 Dasco shoe horn made from polished real horn with leather thong through tip end of the horn. Real horn is a beautiful and tactile material which is immensely strong. Length is between 15" and 16" ; 38 - 41cm. Colours vary from shoe horn to shoe horn! 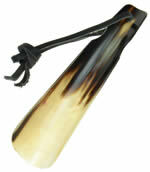 Hand made shoe horn which is made from polished real horn with a leather thong through the tip of the horn. The shoe horn still has the natural curve of the original horn as well as having the tip of the horn. Real horn is a beautiful and tactile natural material which is immensely strong. Each shoe horn is different as the curve will differ as will the colours which vary from shoe horn to shoe horn! Length is a minimum of 12" /30cm. Each. 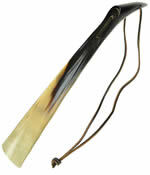 Shoe horn made from polished real horn with leather thong through tip end of the horn. Real horn is a beautiful and tactile material which is immensely strong. Length is between 26-28cm, approximately 11". Colours vary from shoe horn to shoe horn! 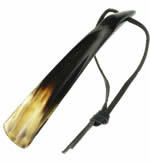 Hand made shoe horn which is made from polished real horn with a leather thong through the tip of the horn. The shoe horn still has the natural curve of the original horn as well as having the tip of the horn. Real horn is a beautiful and tactile natural material which is immensely strong. Each shoe horn is different as the curve will differ as will the colours which vary from shoe horn to shoe horn! Minimum length is 9" /23cm. Each. 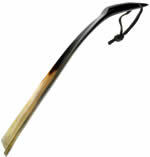 Dasco shoe horn made from polished real horn with leather thong through tip end of the horn. Real horn is a beautiful and tactile material which is immensely strong. Length is between 18-20cm, approximately 7". Colours vary from shoe horn to shoe horn! 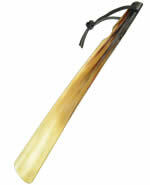 Hand made shoe horn which is made from polished real horn with a leather thong through the top end of the shoe horn. With this shoe horn the natural curve through the length of the horn has been mostly straightened out. Real horn is a beautiful and tactile material which is immensely strong. Each shoe horn is different as the profile will differ as will the colours which vary from shoe horn to shoe horn! Length is 15" / 38cm. Each. 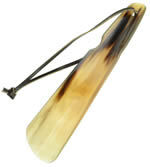 Hand made shoe horn which is made from polished real horn with a leather thong through the top end of the shoe horn. With this shoe horn the natural curve through the length of the horn has been mostly straightened out. Real horn is a beautiful and tactile material which is immensely strong. Each shoe horn is different as the profile will differ as will the colours which vary from shoe horn to shoe horn! Length is 12" / 30cm. Each. 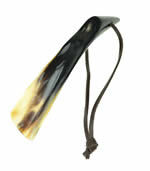 Dasco flat shoe horn made from polished real horn with leather thong through end of the horn. Real horn is a beautiful and tactile material which is immensely strong. Length is around 18cm (7") long. Colours vary from shoe horn to shoe horn! 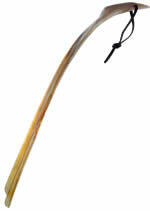 Hand made shoe horn which is made from polished real horn with a leather thong through the top end of the shoe horn. With this shoe horn the natural curve through the length of the horn has been mostly straightened out. Real horn is a beautiful and tactile material which is immensely strong. Each shoe horn is different as the profile will differ as will the colours which vary from shoe horn to shoe horn! Length is 7" / 18cm. Each. 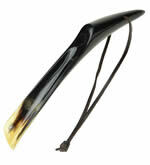 Hand made shoe horn which is made from polished real horn with a leather thong through the top end of the shoe horn. With this shoe horn the natural curve through the length of the horn has been mostly straightened out. Real horn is a beautiful and tactile material which is immensely strong. Each shoe horn is different as the profile will differ as will the colours which vary from shoe horn to shoe horn! Length is 6" / 15cm. 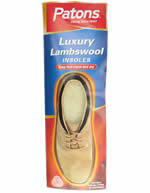 A great shoe horn for keeping in a coat or sports bag! Each. 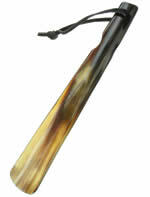 Dasco flat shoe horn made from polished real horn with leather thong through one end of the horn. Real horn is a beautiful and tactile material which is immensely strong. Length is around 10cm long. Colours vary from shoe horn to shoe horn! 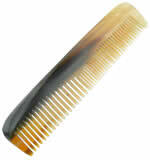 Hand crafted comb made out of real horn with fine and course teeth. Horn combs do not create static like plastic combs. Colours will vary as every horn from which the combs are made is different. 13cm / 5 inches long. Each.